The Miami Dolphins were struggling with a 5-5 record as they traveled to Houston to face the Oilers on November 17, 1996. Having replaced long-time Head Coach Don Shula with Jimmy Johnson, whose Dallas teams won two Super Bowls, the Dolphins had won their first three games before dropping five of their next six. 35-year-old QB Dan Marino (pictured at right) was still at the helm of the offense, although he was proving to be increasingly brittle and had missed three games. The passing game was assisted by the arrival of WR Fred Barnett, signed away from the Eagles as a free agent and who had made an astonishing recovery from a preseason knee injury that required surgery. Rookie RB Karim Abdul-Jabbar provided a boost to the ground game. The Oilers, coached by Jeff Fisher, were also facing a transition as they were scheduled to leave Houston for Nashville. The club was also retooling on the field, with rookie RB Eddie George having an immediate impact and QB Steve McNair in development while veteran Chris Chandler directed the offense. The defense was rugged, particularly against the run. Houston got off to a 5-2 start before suffering two tough losses and the Oilers were at 6-4 as they hosted the Dolphins. There were 47,358 fans in attendance at the Astrodome. Miami’s Coach Johnson was from nearby Port Arthur, Texas, and there was a cheering section in attendance for him. The Oilers had the first possession and drove 65 yards in eight plays. Chris Chandler started off with a pass to Eddie George (pictured below) for 17 yards and WR Willie Davis ran around left end for another 15. Chandler had completions to RB Ronnie Harmon for eight yards and George for seven and, while losses on two plays had Houston facing third-and-18, Chandler connected with WR Derek Russell for an 18-yard touchdown. Al Del Greco added the extra point for the early 7-0 advantage. The Dolphins went three-and-out and, following their punt, the Oilers again drove to another score, advancing 61 yards in eight plays. Chandler completed three passes along the way and a fourth was to TE Frank Wycheck for a 15-yard TD. Del Greco again converted and the home team was ahead by 14-0. Miami responded with a series that was helped along by an 18-yard pass interference call on the Oilers, but after reaching the Houston 21, Joe Nedney missed on a 39-yard field goal as the first quarter came to an end. As the game headed into the second quarter, the teams exchanged punts. The Oilers reached the Miami 49 on their next possession but a punt by ex-Dolphin Reggie Roby was blocked and recovered by RB Robert Wilson at the Houston 31. Five plays later, Dan Marino threw to RB Irving Spikes for a 10-yard touchdown and, with Nedney adding the point after, Houston’s lead was cut to 14-7. The Oilers punted following a short series and the Dolphins regained possession with 3:35 remaining in the first half. Two defensive penalties helped move Miami’s series along. Karim Abdul-Jabbar had a 12-yard carry and Marino connected on two short passes to set up Nedney’s 34-yard field goal on the last play of the half, making the score 14-10 at the intermission. Both teams went three-and-out and punted to start the third quarter. The Dolphins, on their second series of the half, drove 37 yards in eight plays. Marino completed three passes, the longest to Fred Barnett for 25 yards to the Houston 26, and Nedney kicked a 44-yard field goal to make it a one-point game at 14-13. The Oilers came back alive on offense to advance 67 yards in 12 plays. Chandler completed four passes but, following a 10-yard run by George to get the ball to the Miami 12, three passes were incomplete and the home team settled for a 30-yard Del Greco field goal and an extended lead of 17-13. The Dolphins had the ball as the game headed into the fourth quarter, helped along by a fake punt in which LB Larry Izzo took a direct snap and ran for 26 yards to the Houston 42. But after reaching the five, Abdul-Jabbar fumbled just short of the goal line and CB Cris Dishman recovered for the Oilers in the end zone. However, Chandler immediately went to the air and his pass intended for Wycheck was intercepted by LB Zach Thomas, who returned it 26 yards for a touchdown. Nedney added the extra point and the visitors were in front for the first time at 20-17. The Oilers went three-and-out and punted, but they got the ball back at their 35 after Miami WR O.J. McDuffie fumbled when stripped by LB Barron Wortham after catching a pass and CB Steve Jackson recovered. George took off for a 24-yard gain on first down and Chandler threw to Wycheck for eight yards. The drive stalled at the Miami 16 and Del Greco came on to tie the score at 20-20 with a 33-yard field goal. Miami took over on offense with 3:20 left in regulation. Two runs by Abdul-Jabbar netted a loss of two yards, but facing third-and-12, Marino passed to McDuffie for 20 yards to keep the series alive. Two plays later, he threw to TE Troy Drayton for a pickup of 51 yards to the Houston five. From there the Dolphins were able to run the clock down and Nedney kicked a 29-yard field goal on the game’s last play to give Miami a 23-20 win. The Dolphins had the edge in total yards (303 to 261) while the teams were even in first downs with 17 apiece. Miami turned the ball over twice, to one suffered by the Oilers. Houston accounted for three sacks, to two by the Dolphins, and Miami drew six penalties to four flags thrown on the Oilers. 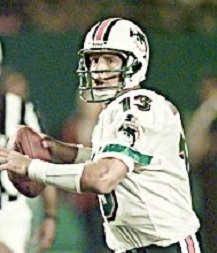 Dan Marino completed 21 of 28 passes for 237 yards and a touchdown with no interceptions. O.J. McDuffie (pictured at right) had 8 catches for 86 yards. Thanks to his long fourth quarter reception, Troy Drayton gained 63 yards on two catches and Fred Barnett contributed 5 receptions for 53 yards. Karim Abdul-Jabbar topped Miami’s rushers with 59 yards on 18 carries. For the Oilers, Chris Chandler was successful on 15 of 27 throws for 167 yards and two TDs while giving up one interception. 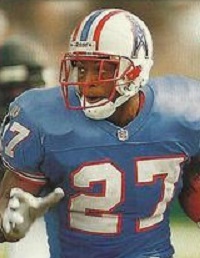 Eddie George rushed for 60 yards on 15 attempts and caught three passes for 34 yards. 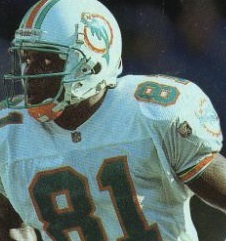 Frank Wycheck topped the receivers with 5 catches for 54 yards and a touchdown. The win put the Dolphins above .500 but they lost their next three games before finishing out the season with two wins for an 8-8 record that placed fourth in the AFC East. Houston lost three of its last five contests to also end up at 8-8 and fourth in the AFC Central. Due to wear and tear, Dan Marino had one of his least productive seasons, passing for 2795 yards and 17 touchdowns, although his 87.8 passer rating and 7.5 yards per attempt ranked among the league leaders. Fred Barnett managed to catch 36 passes for 562 yards (15.6 avg.) and three TDs in nine games while O.J. McDuffie led the club with 74 receptions for 918 yards (12.4 avg.) and eight touchdowns.